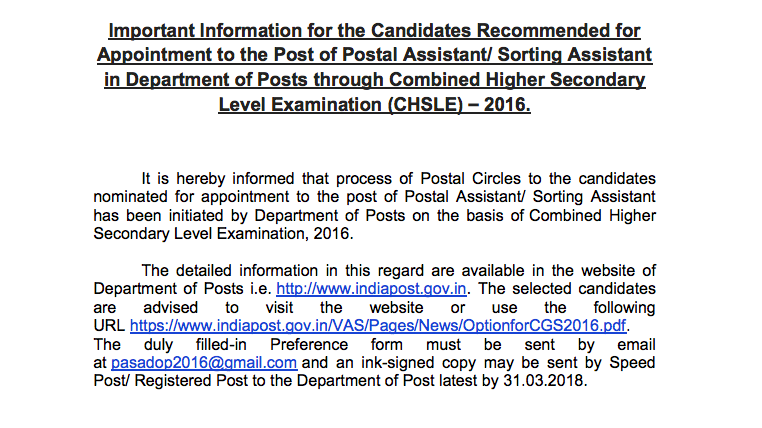 It is hereby informed that process of Postal Circles to the candidates nominated for appointment to the post of Postal Assistant/ Sorting Assistant has been initiated by Department of Posts on the basis of Combined Higher Secondary Level Examination, 2016. The detailed information in this regard are available in the website of Department of Posts i.e. http://www.indiapost.gov.in. The selected candidates are advised to visit the website or use the following URL https://www.indiapost.gov.in/VAS/Pages/News/OptionforCGS2016.pdf. The duly filled-in Preference form must be sent by email at pasadop2016@gmail.com and an ink-signed copy may be sent by Speed Post/ Registered Post to the Department of Post latest by 31.03.2018.